After a bunch of playtesting and goldfishing I've got a new baseline going that is working pretty well. Turns out new Ugin doesn't help the deck all that much, and really only does the ramping the Oblivion Sower can, but a lot more awkwardly since I can't ramp plain colorless as well as I can Eldrazi. Upped the number of new Karns to compensate for this. Not sure what the right number is, but I hardly saw it at 2x, so now to try 3x. Got the landbase situated pretty nicely, although I miss the inclusion of the ~2 Ghost Quarter s. Adding Zhalfirin Void definitely helped clean up the topdecks. The single of Warping Wail in the MB may end up being an All Is Dust , in which case I would do a 2-of Wail in the side. Matter Reshaper helped fill the gaps in the curve, as well as provide a little bit of CA. Cindervines in now in place of a few instants. 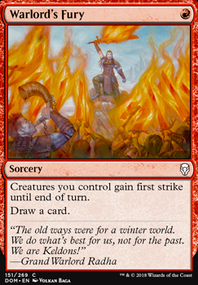 The fact that I can put this down before it's needed really frees up the mana turn-by-turn. I'll have to see if the split cost ends up hurting too much to run it with the current landbase. The 1-of Phyrexian Metamorph has been awesome so far! Copying my own Thought-Knot Seer is great, and even the larger Eldrazi (unfortunately you lose the cast triggers) has worked out well. The best part is copying an opponent's key permanents (with the help of LMC), like planeswalkers. 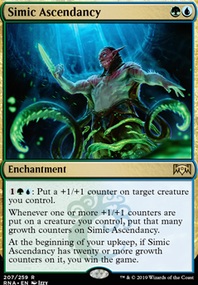 Since Metamorph is entering the battlefield as a copy of that planeswalker, it still starts at the appropriate level of loyalty counters. This has been huge when copying a Lili, Karnfather, regular Ugin, etc.. Still have a lot of playtesting and adjustments to do. 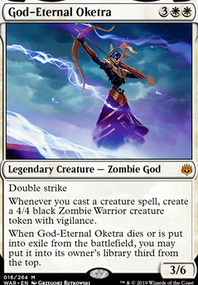 I would really like to get a little more LD into the deck, even if it's just getting the GC's back (might drop some Voids), but so far it is very fun, and the most I have ever been able to use LMC. Legion Warboss could provide you a 1/1 hasty goblin each turn. And Skirk Prospector would help you playing these big creatures earlier. Honestly I don't know what's wrong with Goblin Warchief , this guy allows you to activate Krenko's ability as soon as you cast it, and also cast every goblin faster after turn 3. Giving haste to all these small 1/1 is crucial, cause the more you trigger Cavalcade of Calamity the better. I don't think you need so many sorceries, I like to play a bunch of small creatures in my goblin deck (https://tappedout.net/mtg-decks/goblin-meat-shield/) but I understand your choice. 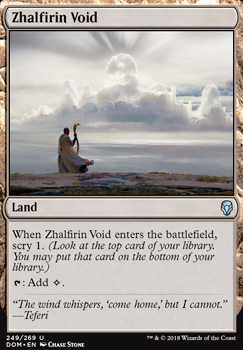 Zhalfirin Void is nice but with only 8 regular mountains and 16 lands in total, my guess is you will often be short of mana. 18 sounds better, again it's just my advice. I think I will end up adding Growing Rites. Don't like the angel either to be honest, definitely like the Claws much more. The main problem is figuring out what to cut lol. Zhalfirin Void is an interesting card, I might try that out instead of Tectonic Edge ( Ghost Quarter draws way less hate). My take on Titania isn't that all-in on the big land-sac swing turn, playing mono-green means I need to cater to my inner Timmy heh. Hope the Winding Canyons works out in your build, like you said mine has more creatures so for me it's excellent at least. 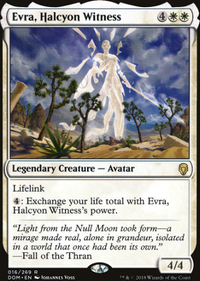 In traditional Tron decks they play Map and Scrying because their deck really doesn't function until they have Tron active. (Karn looks kinda bad if it takes 7 turns to get there) They play them because they must, the deck wont work without consistent t3. Your deck looks like it can function without t3 Tron fine, and in that case it is just a huge highroll potential. But if you're adding them just for the highroll potential, wouldn't it make more sense just to add more consistently solid lands instead? Like Manlands, Horizon Canopy or Zhalfirin Void ? Getting to cast really big Walky-B's is cool and all but it does seem like winning more at that point, and winning more is a loose description because it does require a lucky draw to begin with. Copter may still be right. Some lists even run two. I took it out because it's so vulnerable to so many kinds of removal, and put in Matter Reshaper #3, for now. Reshaper is usually straight-up card advantage, where Copter is conditional filtering. Zhalfirin Void makes me feel less committed to the 1-of flier. I've also recently seen a Copter-free list running a singleton Endbringer , which might even be better, though I don't love the casting cost. This list is a living document for me, and reflects the state of my build as I play it 9 rounds a week at a large and competitive LGS in my hometown.